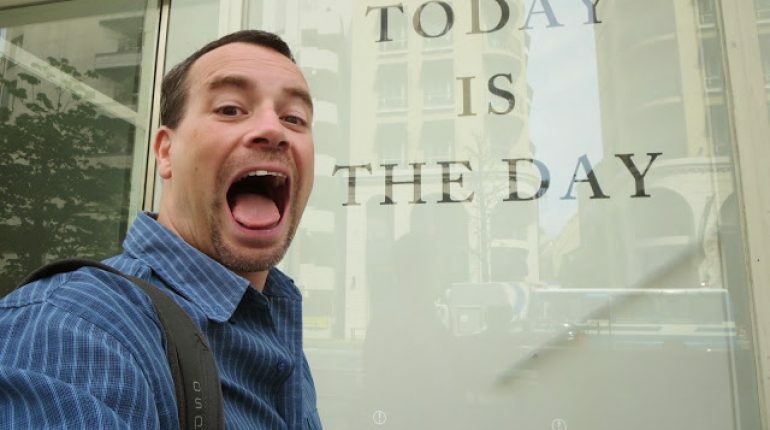 Okay, so I know the tagline for this adventure was 101 days in Asia and today was day 102 but I couldn’t really end my trip on a rainy day, now could I? Even though I was mentally ready to tredge all day in the pouring rain, I was delighted to find a clear sky when I opened my curtains this morning. I still wore two pairs of socks, my pants and a long sleeve shirt over my tshirt. We left the hotel at 9:30am and by 10:00 my long sleeve shirt was off. By the afternoon I was down to one pair of socks and my pants were, oh so fashionably, rolled up past my knees into makeshift shorts. Yeah, it was really nice day out today – all day. Go figure. Pouring rain yesterday, bright and sunny today. Okay, so today was probably the most ambitious travel day I’ve had probably in any of my trips so there’s alot to write. 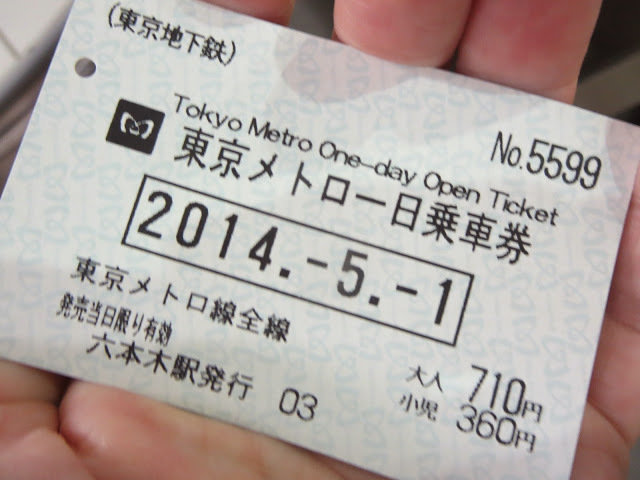 We went to the subway station by our hotel and bought an all day pass as we’d be using the subway quite a bit. I had spent time last night taking the list of things that Ben had suggested and figuring out how to piece it all together including which subway lines to take where. The Tokyo subway system is huge and there are no fewer than a dozen different color coded lines that intersect with each other throughout the city. 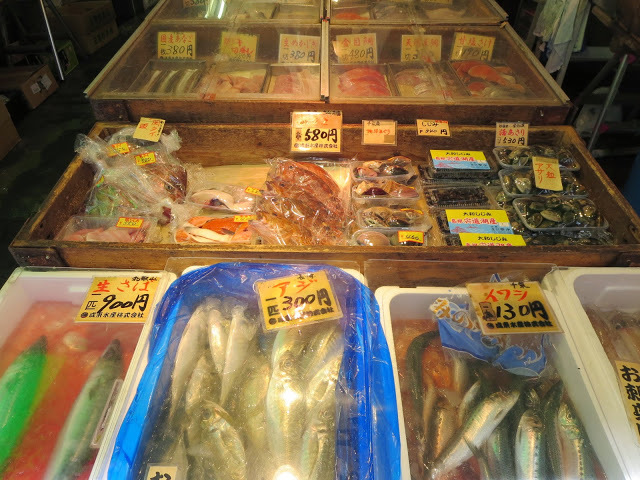 Now, like other fish markets throughout the world, most of the action here is in the early morning hours. 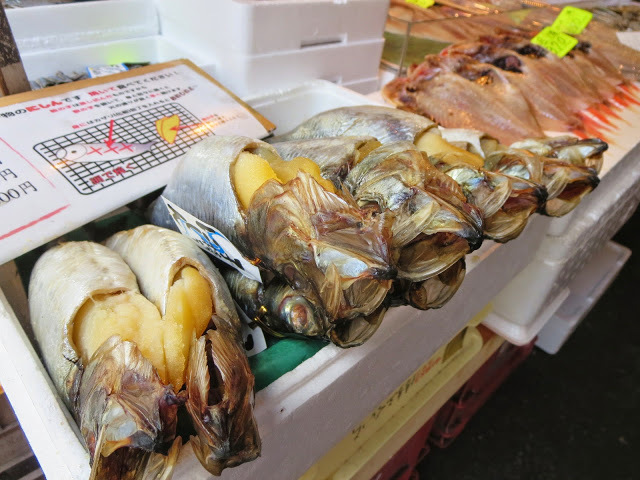 We knew we’d miss the guts (pun intended) of what a fish market is all about by getting there at 10am so, instead, we walked about the market. 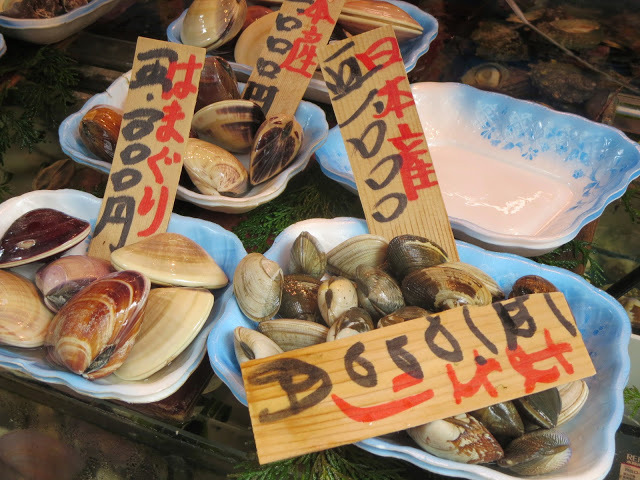 Since sushi and seafood are such a staple in Japanese meals, there were so many stalls there. Some sold fish and then others took that fish and used it to prepare some great meals in their restaurant. 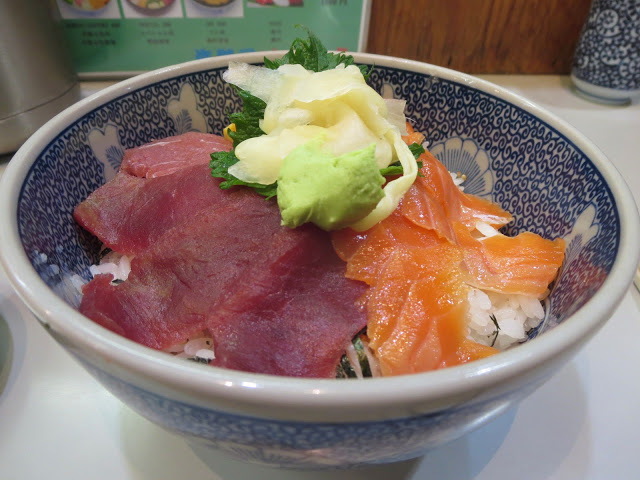 Now, technically, we didn’t have sushi but had Maguro-Salmon Don which is a rice dish topped with fresh salmon and tuna. 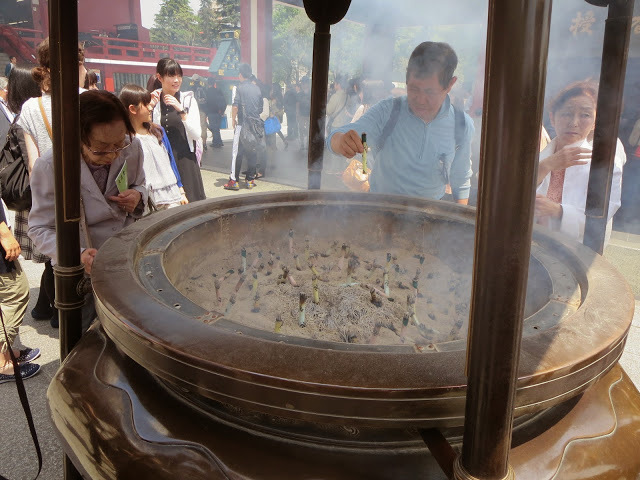 The temple and the shrine are actually both in the same area about a 10 minute walk from the station. 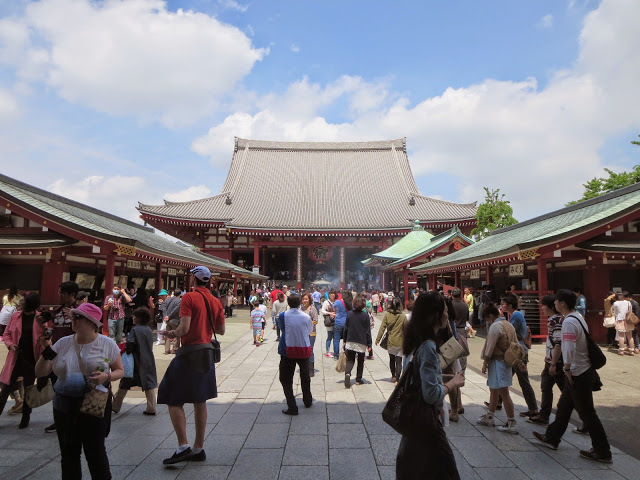 The area was full of locals and tourists alike visiting the sites. As you enter the grounds you hear the sound over and over again of people at different counters shaking metal cylindrical boxes. All the people doing the shaking were locals so I went over to take a look at what they were doing. Turns out the noise coming from the metal boxes were from a bunch of wooden sticks inside. 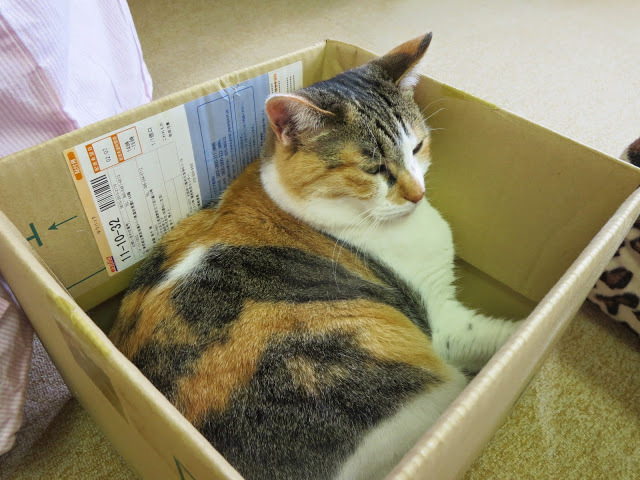 They would shake the box until a stick came through a little hole at the top of box. 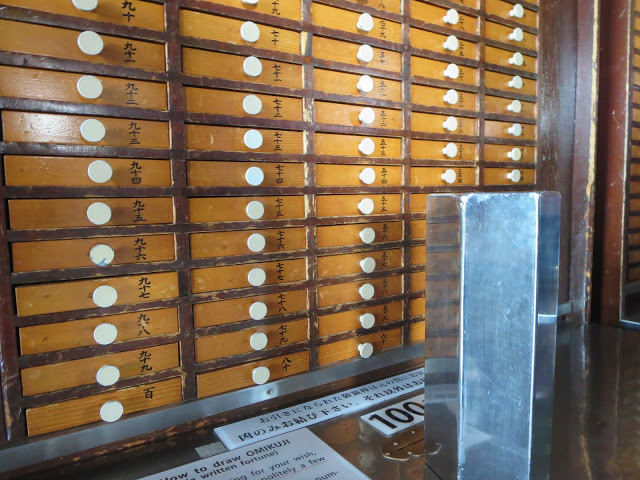 Each stick had a corresponding number (in Japanese symbols) and then they would open the drawer with the corresponding number from the bank of drawers in front of them. Inside the drawer was their fortune. I decided to give it a try. 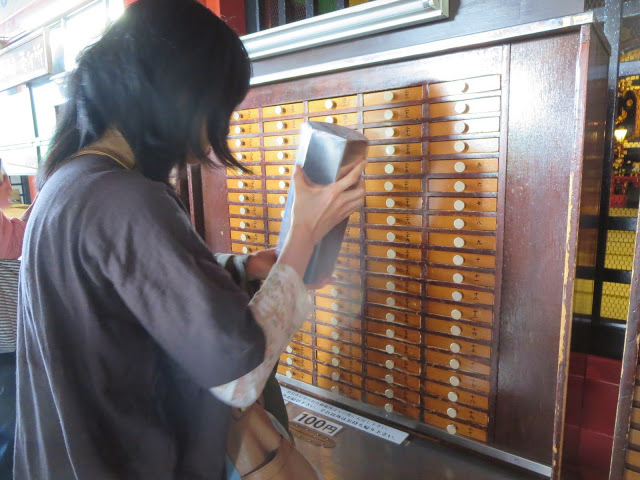 I first put a 100 yen coin ($1) in the donation box in front of the counter and then shook, shook, shook until a stick came out. 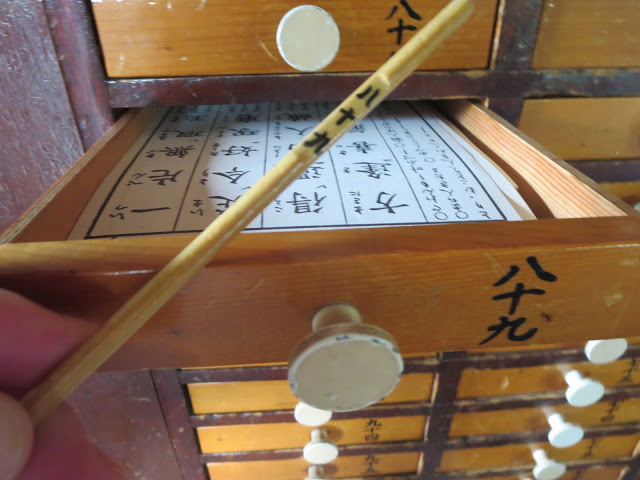 Now the hard part… matching the Japanese symbols on the stick with the ones on the bank of drawers. It actually took me a couple of minutes of scanning the drawers but I eventually found it. My fortune was mostly written in Japanese but there was a little part in English which basically said great things are going to happen for me. 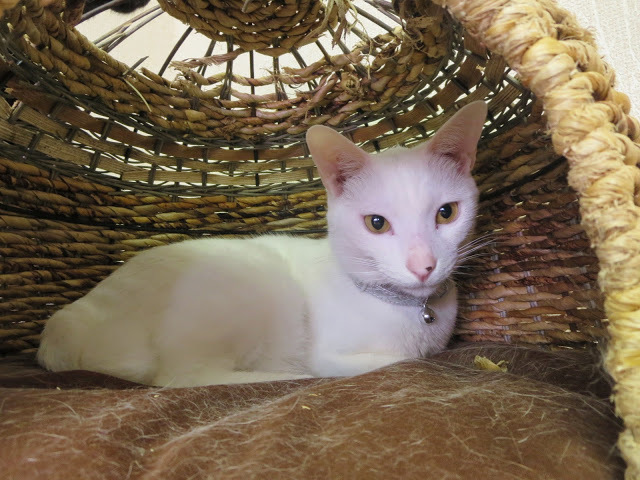 I can’t remember who told me but someone along the way on my trip told me when I went to Tokyo I had to check out the Cat Cafe. I think it more had to do with the fact that I love cats than anything else. I pictured a cat cafe as a restaurant with some cats roaming around. Actually it’s more like someone’s living room where you can stop by and just play with cats. 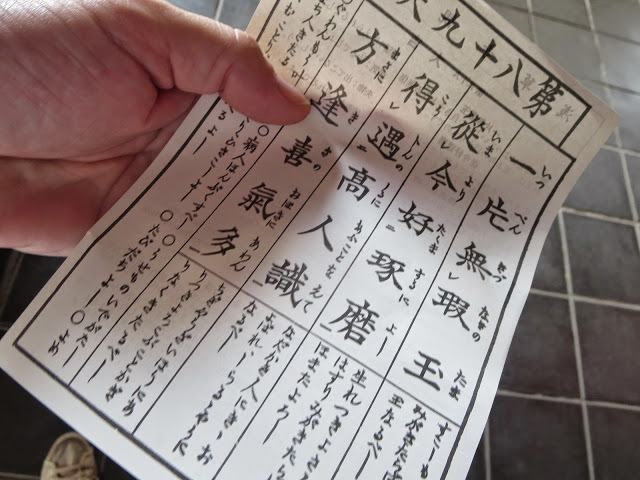 The place was on the 6th floor of a non descript building a short walk from the temples. 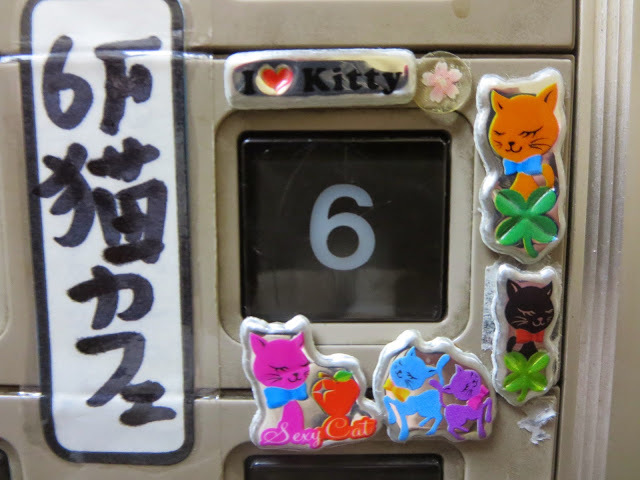 If you weren’t sure where to go once you entered the elevator there were a bunch of little cat stickers next to the number 6. I pressed 6 and went up to the 6th floor to find a lady in her 50’s at the door. 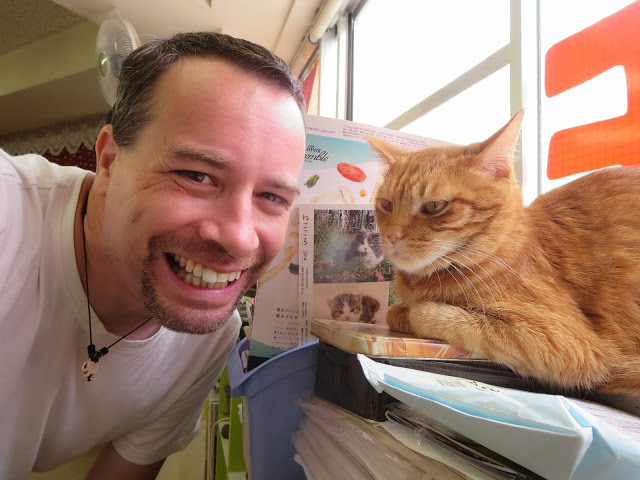 I felt kinda silly paying 800 yen ($8) for an hour of play with cats but, then again, it was an experience. 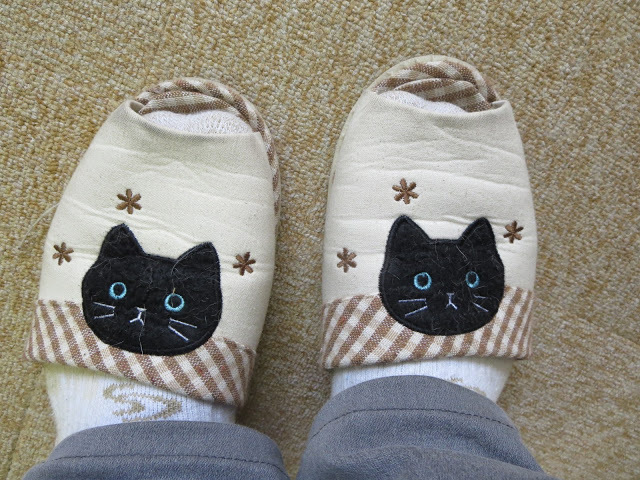 I took off my shoes and put on a pair of cat slippers to walk around in and entered the “living room”. There was one other woman there already playing with the cats. Whether she worked there, was a friend of the owners or was just another customer – I have no idea. In total there were 17 cats there. All different shapes and sizes and colors. One thing I found interesting was that apparently most Asian cats are genetically born with crooked tails. Why this is, I also have no idea but it was kinda cool to see these cats prancing around with a crink in their tail or a cute little curve in it. As time was of the essence I only spent 15 minutes there but it was long enough to get my cat fix in. 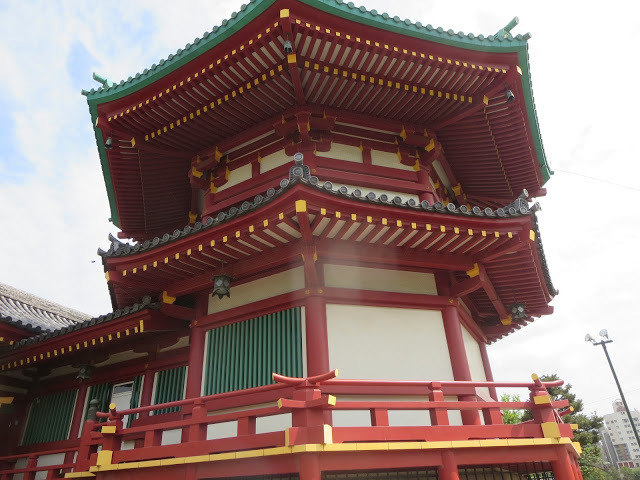 Just outside the Ueno station is a park complete with lake, temple and food stands. 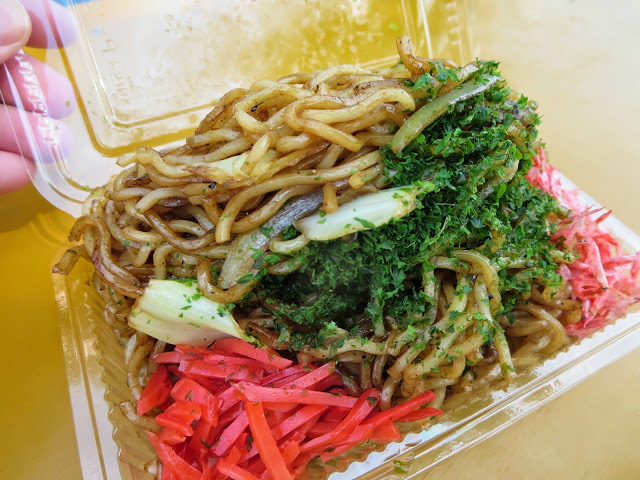 We passed by a Yakisoba stall and since I had yet to try it (one of the few Japanese dishes I hadn’t had) Ben bought an order to share. The man kept piling more and more noodles into the little takeout container. No skimping here. We went to a nearby bench and chowed down on it. Pretty good dish. The temple was just right by the lake. We didn’t go inside but, really, all the beauty is in its’ design on the outside. The lake, like the other bodies of water I have seen in Japan, was full of Koi fish. 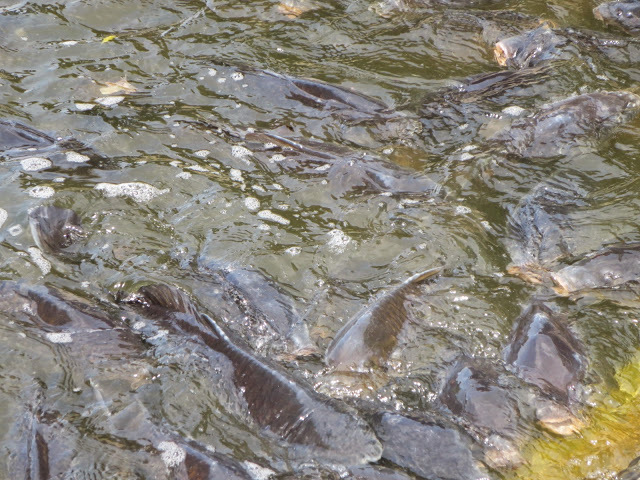 I wish pictures could accurately portray the sight of dozens of fish coming up to the edge where you are standing with mouths chomping open looking for food. They definitely know when you arrive as they all swim towards you expecting you to drop food for them. 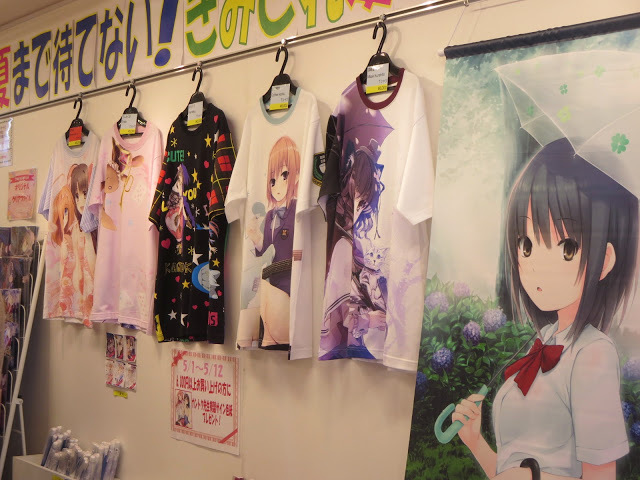 The Akihabara area is known as the electronics area. Basically, it’s a haven for nerds. 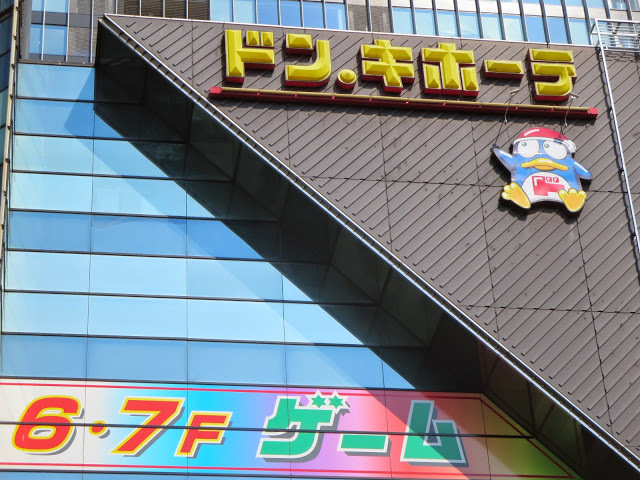 The place is store after store of gaming arcades and electronics stores. 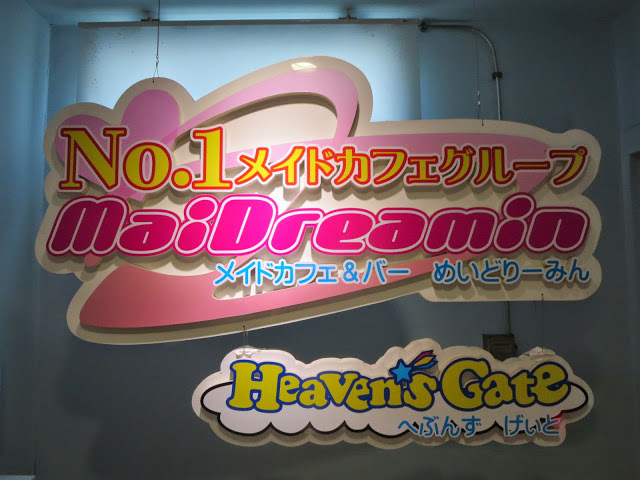 We saw one of the handful of maid cafes in the first building by the subway exit so we went inside to check it out. Maid cafes are basically (overpriced) restaurants where you are served by young girls in maid outfits. I expected a cover charge to get in and I was fine with the 1000 yen ($10) they were charging but then they also added that no photos were allowed. Well, I guess I can understand that. I mean, who wants their photo taken at work when you’re walking around in a skimpy maid outfit, right? But then they also insisted that we had to order two items from their menu. Well, this was getting a little ridiculous (and pricey) so we passed. 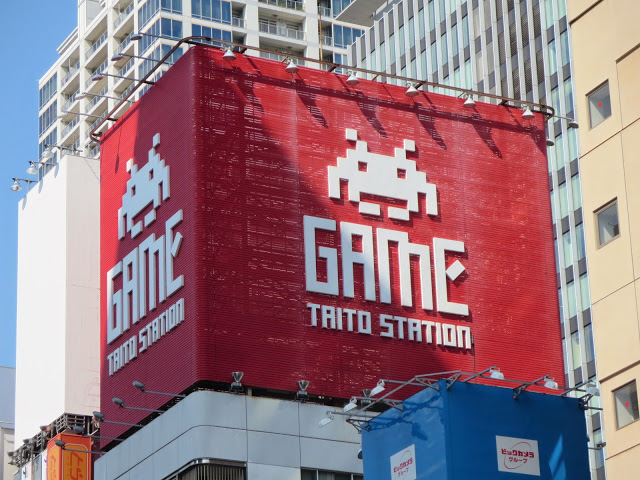 As for the rest of the area, well, like I said – alot of arcades and electronics stores. We walked up the street passing by all the stores and stopping occasionally to take a photo or two of some cool signs. 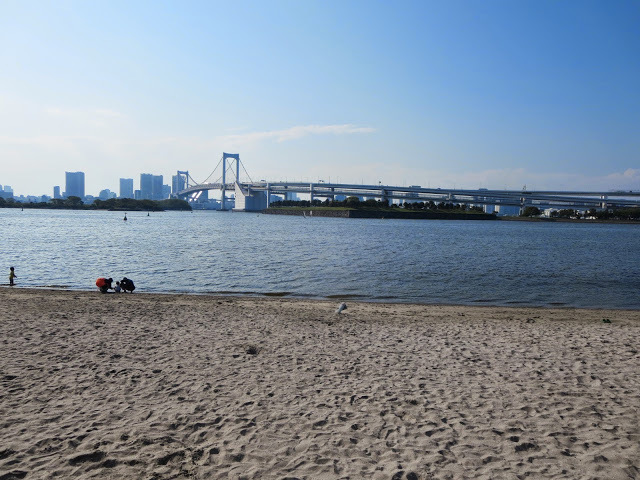 Odaiba is one of the man made islands here in Tokyo. It’s basically a place for amusement. 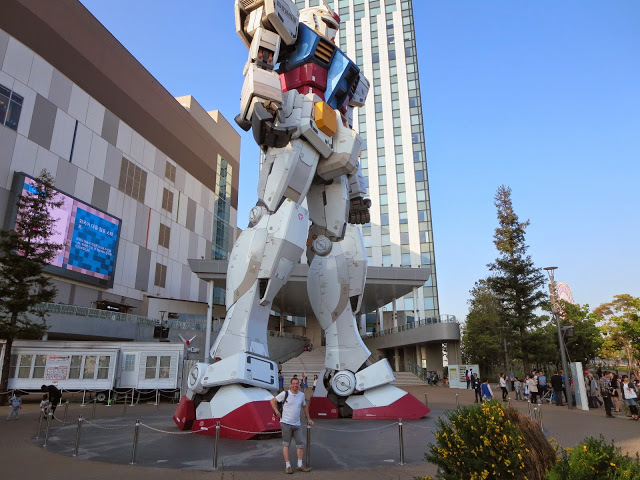 Along with a beach on the waterfront (one of the few in Japan, certainly the closest in Tokyo), there is also an aquarium, ferris wheel, a tv studio, a bunch of malls and lego land. 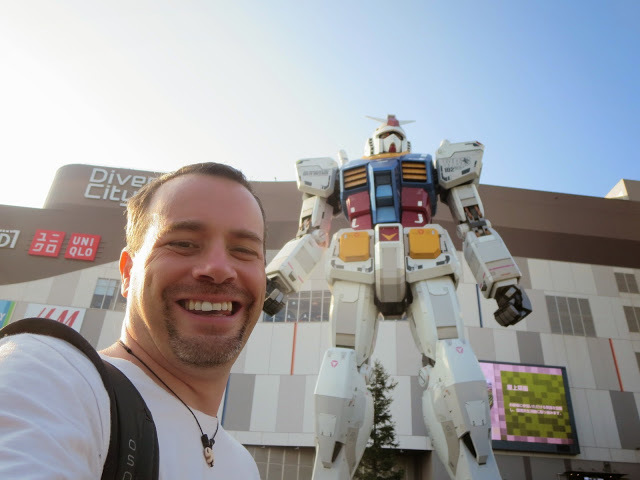 Well, when I heard there was lego land here in Tokyo, I knew that was going on my list of places to visit. Sadly, the night before, as I was researching stuff I found on their website that adults aren’t allowed without children. After trying to figure out how to rent a kid for a few hours I resigned myself to the fact that there would be no lego in my day today. 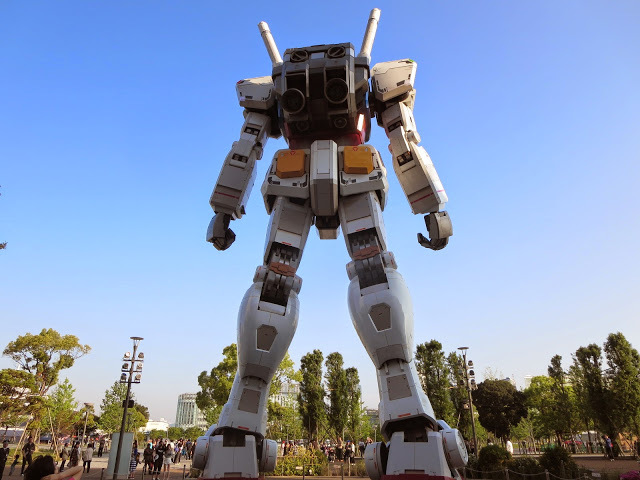 Standing 60 feet tall right outside the entrance to the Diver City mall is the Gundham robot. The robot stands there ominously as people gather around to take pictures with it. After taking a bunch of photos we had another meal in the food court of the mall. 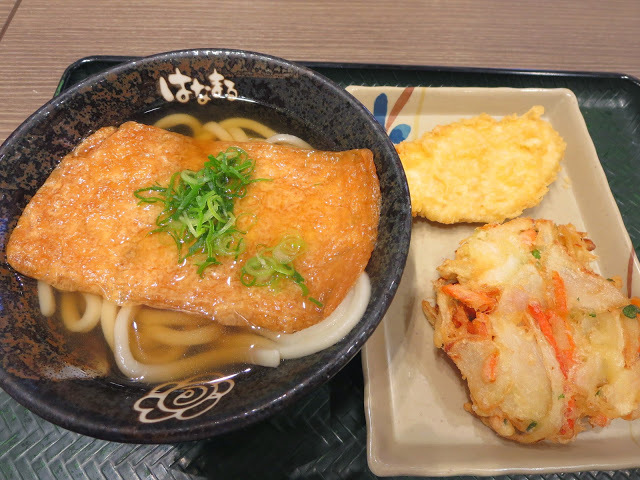 This time I tried an udon noodle dish topped with a deep fried bean curd wafer along with a couple pieces of tempura. Ben told me about how there were strange people doing strange things outside the park by the station here. What kind of strange things? I don’t know but how can I pass up the chance to see strange people. By now though it was close to 6pm and I guess all the strange people had turned in for the night because we just walked. Oh, my, God… my legs were killing me! Okay, so after a long walk looking for strange people, all I wanted to do was go to a restaurant, sit down, and have a really nice last meal for my trip. 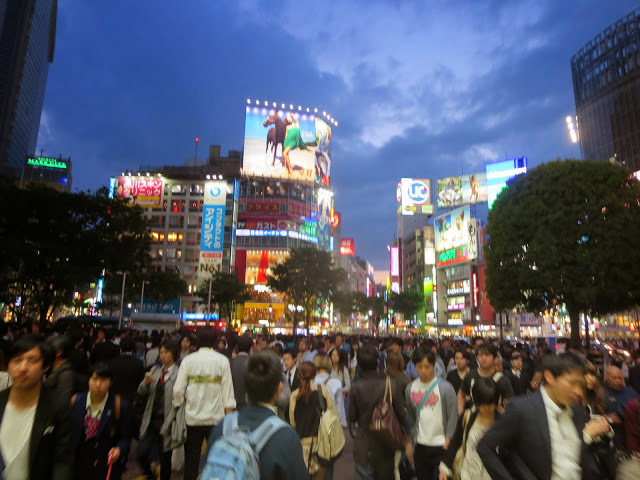 We went to the Sibuya area which is the busy area we visited the other night with the busiest intersection in the world. 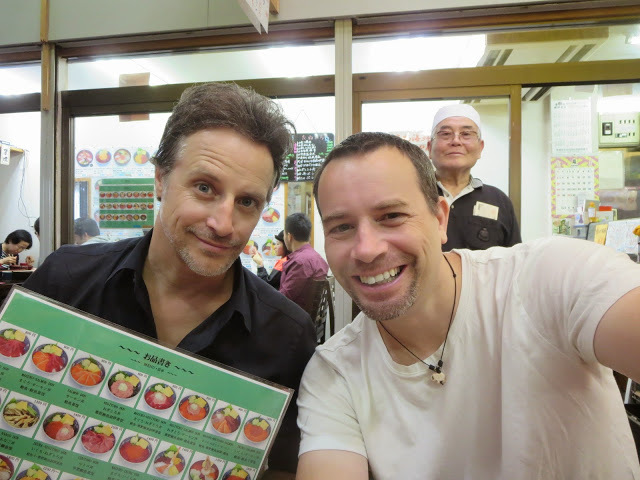 Now, I’ll admit – I wanted my last meal for my trip to be perfect. 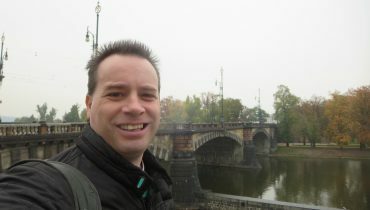 I had it clear in my mind but translating it to Ben and actually finding a place to go to was not easy. We ended up walking around another 40 minutes looking for the perfect place. Ben would take me to a place, I’d look at the menu, shake my head and we’d move on. After awhile the search became frustrating for both of us. By the end of our search I had abandoned looking for the perfect place with the perfect meal in exchange for just finding food. I was starving and we had been on our feet for almost 10 hours at that point. We finally stopped at a place but not without my frustration boiling over and us having another argument. This one wasn’t major though as we quickly got over it as I think we both knew it was the result of a long day. Plus, the food was really good. 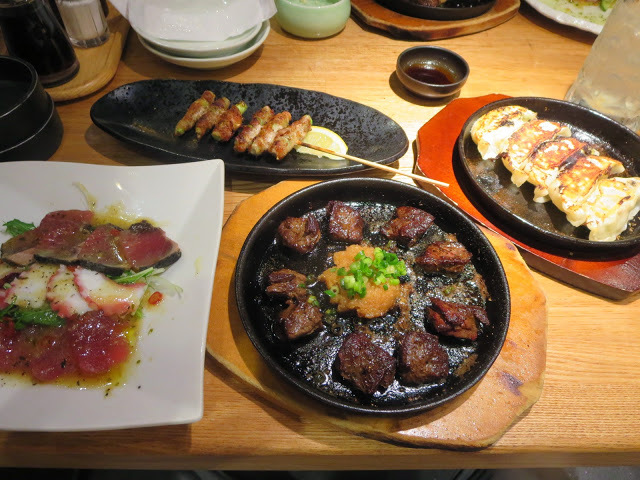 I ordered 4 different dishes: a mixed sashimi plate, sizzling beef tenderloin, gyoza, and pork wrapped asparagus. As we ate dinner and tensions eased I opened up about alot of stuff going on with me in my life. It was nice to have a sounding board which I sorely have lacking back home. We talked about alot of stuff and I actually felt the closest to my brother I had felt in years. I have a pretty clear idea of what I want to do when I get home in the coming days and am excited to start that adventure. As for this trip – it’s coming to an end. It’s been almost three and a half months which is a long time to travel. I’ll post another blog tomorrow about my journey home and then a kind of recap one in a few days time after I settle in back home.